• Should longtime ranchers or jumping mice be given preference during drought? Forget Smokey the Bear. Ranchers in Otero County, New Mexico, find themselves in an escalating dispute with the United States Forest Service (USFS) over adequate access to water for their drought-stricken cattle. But while the USFS insists that it has acted properly and legally, the county commission and sheriff have come down strongly on the side of frustrated ranch-owners, raising significant issues of individuals’ and states’ rights versus the power of Obama’s White House. 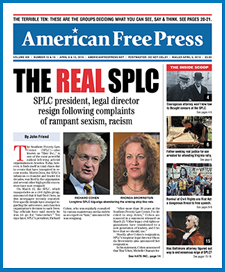 In a series of interviews, May 16- 19, AMERICAN FREE PRESS conducted an in-depth investigation. Rancher John Bell, whose great-grandfather was a territorial legislator, explained, “We are trying to follow the rule of law, but our patience is wearing thin.” He asserted that federal officials, by contrast, were ignoring laws and court decisions. Presently at issue are water and grazing rights in the Lincoln National Forest, “the birthplace of Smokey Bear, the living symbol of the campaign to prevent forest fires,” almost 1,000,000 acres located east of Alamogordo in the Sacramento Mountains of south central New Mexico. In some cases, ranchers’ water and land rights go back over a century, antedating both state and federal regulation. In all cases, say the New Mexicans, the water rights existed prior to and preempt later legislation on which the USFS relies in excluding access to certain water sources. This view was affirmed by the U.S. Supreme Court in U.S. v. New Mexico (1978), but the USFS sees it otherwise. Previous barbed-wire fences were replaced recently with metal-pipe fences, which exclude rancher Judy Holcomb Medeiros’s cattle, but not thousands of elk or feral pigs. The locals say the latter damage the watersheds more than cattle, which have only a seasonal presence. The USFS intends to place similar pipe fences around eight other water sources, including Sacramento Lake, creating similar difficulties for other ranchers over a wider territory. A five-year drought has exacerbated the conflict, reducing water available to cattle. And while Joyner claimed that access to the Agua Chiquita has been closed for three-and-a-half years, he nevertheless alleged that “livestock” recently had damaged the spring area, turning it into a “muddy puddle.” He did not explain why elk and swine should be preferred to ranchers’ cow-calf herds nor why large wildlife, but not cattle, are permitted to destroy the jumping mouse habitat. USFS attorney Steve Hattenbach maintained USFS owns the forestland—although it only manages public lands on behalf of the American people—and even disputed the existence of ranchers’ water rights. He pointed out that the New Mexico Supreme Court ruled in Walker v. U.S. in 2007 that there is “no appurtenant right to graze” where water rights exist. He stated that Medeiros and others must find an acceptable way to get water to their cattle. It remains unanswered, though, how that fully upholds grazing and water rights. The officials alleged that cows still have easy and adequate access to sufficient water, but they are nevertheless willing to work with ranchers, to help cattle during the drought. That seemed unapparent, however, at a May 16 conference. Otero County officials traveled all the way to Albuquerque to meet with Acting U.S. District Attorney Damon P. Martinez and USFS and Department of the Interior representatives. The Otero people hoped to find a positive resolution, at least temporarily, but were bitterly disappointed. The current conflict is just the latest in decades of troubles for ranchers, whose livelihoods, private property rights and way of life have been choked off increasingly by multiple overweening federal agencies. Dunn relates that federal officials have also gone after oil and mining production in southeast New Mexico, imperiling the entire regional economy. And with the lesser prairie chicken now “endangered,” farms and ranches from New Mexico to Kansas could be shut down by Washington. Dunn and Herrell both related that federal officials claimed authority to close off access to public lands, but no authority to re-open them. The question of who does have that authority got “no real answer.” Dunn suspects that White House Counselor to the President John D. Podesta may be behind the growing persecution of these honest American ranch-owners, but the federals refused to respond to that assertion. The USFS plans “no confrontation” with ranchers but threatens to prosecute “violators.” Dunn, however, is seeking a civil injunction against the federal government, as Representative Steve Pearce (R-N.M.) demands a congressional inquiry. Meanwhile, Sheriff Benny House and the county’s district attorney are considering criminal charges against USFS employees. I’ve done some reading lately in Prof. Hamburger’s 2014 legal treatise “Is Administrative Law Unlawful?” that indicates that the difference between a patent on an invention lasts only 17 years and the patent on land lasts forever. The right to exclusive use is the purpose of both types of patent. Estates in land include the right to prevent trespass, that by operation of the meaning of the word trespass, renders invalid the creation of effective involuntary encumbrances on the land such as a paramount right of a mouse to habitat on private property. While Karl Marx called property theft, our Founders considered property rights to be human rights. Using the Endangered Species Act to put animal rights ahead of human rights is enslavement to the common good that destroys the priority of Constitutional individual rights that require just compensation for property taken for public mouse purposes.